Developed in Europe over 20 years ago, HeatShield's® proprietary Cerfractory® technology is a hybrid ceramic/refractory material. It combines the strength of a high fired ceramic with the heat resistance of high temperature refractory cement. HeatShield® Cerfractory® Flue Sealant is supplied as a dry powder that is mixed with tap water immediately before use. Once applied, the product air cures to a hard ceramic like material that is moisture and corrosion resistant. The unique Cerfractory® technology maintains its physical shape and chemical properties even when subjected to high temperatures. Underwriters Laboratory (UL) has developed the UL 1777 Standard for Chimney Liners to investigate the performance of chimney liner systems. By UL’s definition, a chimney liner is a system to be used in conjunction with a chimney that is constructed from metallic or nonmetallic materials that are factory made or mixed, and that is assembled in the field to form a complete, functional means for conveying products of combustion to the outside. The UL 1777 testing was performed on the HeatShield® Cerfractory® Flue Sealant and CeCure Sleeve Liner Repair System at Intertek’s Warnock Hersey Hearth Products Lab in Middleton, Wisconsin. The following is a brief overview of this testing. To begin testing, an unlined masonry test chimney was constructed in the hearth lab, according to the UL 1777 specifications. The test chimney is then surrounded with the wood test rig (with embedded thermal couples) with zero air clearance between the outside of the chimney and the wood test rig which is framed in contact with the outside chimney. The HeatShield® Cerfractory® Flue Sealant and CeCure Sleeve Liner System was then installed into the unlined test chimney. After drying, a series of tests were performed to determine the effectiveness of the HeatShield® Cerfractory® Flue Sealant and CeCure Sleeve Chimney Liner System. The first phase of the UL 1777 test is a successive temperature test. With the use of a flue gas generator connected to the chimney, temperatures are maintained at 1000°F for 8 hours, 1400°F for 1 hour and then subjected to 3-10 minute blast periods at typical chimney fire conditions of 2100°F. The exterior temperatures of the chimney are monitored by the thermal couples imbedded within the wood test rig. During each phase of the temperature test the maximum temperatures measured within the test rig were approximately 11% less than the maximum temperatures allowed during the test. After the rigorous temperature tests, the chimney is allowed to cool and inspected to verify that the liner system was free of cracks, distortion or other damage. The chimney is then swept 100 strokes with a steel wire chimney brush, about the same number of strokes required for 20 annual cleanings. The standard allows for the removal of no more than 1% of the total weight of the repair material installed. After sweeping, only .2% of the total weight of the repair material was removed. The compressive strength of the material is measured on a universal test machine in accordance with ASTM C495. The strength of the HeatShield® Cerfractory® material was over two and a half times stronger than the minimum compressive strength allowed in the Standard. To ensure the material can resist the destructive acids found in flue gases, samples of the material are immersed in a sulfuric acid solution for 48 hours. The acid soluble matter in the HeatShield® Cerfractory® material was determined to be less than 1%. The maximum percent of acid soluble matter allowed in the UL 1777 standard is 3%. The Freeze/Thaw Resistance test tests the material's ability to withstand moisture and temperature extremes. Samples are immersed in water for 24 hours, boiled for 5 hours, and then immersed for 72 hours. Samples are then frozen for 16 hours and placed in an oven at boiling temperatures for 7 hours. These extreme cycles are repeated 3 times with the samples immersed in water for 1 hour between cycles. The standard allows for weight loss up to 5%. The tested HeatShield® samples were found to have less than 1% weight loss during this test. The HeatShield® Cerfractory® Flue Sealant/CeCure Sleeve Liner System was found to be compliant with all aspects of the UL 1777 performance tests for Chimney Liner Systems. The product is listed to UL Standard 1777 with zero clearance to combustibles by ETL-Intertek under the Warnock Hersey label as a chimney liner system for masonry chimneys that service most gas-fired, oil-fired, and solid-fuel-fired residential-type appliances. In addition to HeatShield’s® listing to UL 1777, the product is Certified by ETL-Intertek to conform to the applicable standard through a rigorous program of ongoing testing and factory inspections. The HeatShield® Cerfractory® Flue Sealant/CeCure Sleeve Liner System is available through a network of factory trained, independent installers. Find your nearest HeatShield® Installer here. Various ASTM and other performance tests were conducted at Intertek Testing and Orton Materials Testing and Research Center to investigate HeatShield's effectiveness for restoring damaged and deteriorated fireclay lined flues in masonry chimneys. An outline of investigation was developed and followed using various ASTM tests and the UL 1777 Standard for Chimney Liners as a guideline. Because there are no published listings or listing requirements for clay flue tile or repair systems, it is important that any prescribed remedies be tested within the systems they are intended to repair. To begin testing, a masonry test chimney was constructed in the hearth lab and lined with 12"x12" fireclay flue tile liners. During construction, each square flue tile was set with regular mortar on two opposing sides of each joint; the other two sides were left open with no mortar. The chimney was cured for 30 days, at which time the flue tiles cracked by thermal shock from a chimney fire. Using a winch and a specially designed foam plug, the HeatShield® Cerfractory® material was applied to the walls of the clay flue tile for the purpose of restoring the original integrity of the chimney's ability to contain and vent the products of combustion to the outside. After drying, a series of tests were performed to determine the effectiveness of the HeatShield® Cerfractory® Flue Sealant to restore a chimney's ability to contain and vent the products of combustion to the outside. The first phase of the Prescribed Use Testing was a successive temperature test, similar to UL 1777. With the use of a flue gas generator connected to the chimney, temperatures are maintained at 1000°F for 8 hours, 1400°F for 1 hour and then subjected to 3-10 minute blast periods at typical chimney fire conditions of 2100°F. After the rigorous temperature tests, the chimney is allowed to cool and inspected to verify that the repair system was free of cracks, distortion or other damage. As in the UL 1777 test, the chimney is then swept 100 strokes with a steel wire chimney brush, about the same number of strokes required for 20 annual cleanings. Using UL 1777 as a guide line which allows for the removal of no more than 1% of the total weight of the material installed. After sweeping, only .05% of the total weight of the repair material was removed. Following the Temperature and Sweep Tests the bottom and top openings of the chimney were sealed and the chimney was pressurized for 1 hour. The total air leakage during this time is measured to verify the repaired chimney remains air (smoke) tight following the Temperature and Sweeping Test. The American Society for Testing and Materials (ASTM) has created a standard designated as C 199 - Standard Test Method for Pier Test for Refractory Mortars. 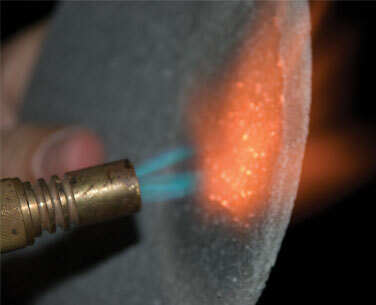 This test determines the refractoriness of high temperature mortar to determine if the prescribed heat treatment causes the mortar to flow out of the joints. Under this test method there are three classes of refractory mortar; Medium-Duty, High-Duty and Super-Duty. Nationally recognized building and fire codes specify fireclay flue liners be bedded one on the other in a Medium-Duty (per ASTM C199), non-water-soluble refractory cement mixture or equivalent. The HeatShield® Cerfractory® Flue Sealant was tested to ASTM C199 by Orton Materials Testing & Research Center and passed the Super-Duty classification. Under this test standard, HeatShield® was proven to perform at temperatures in excess of 2900° F for 5 hours. The American Society for Testing and Materials (ASTM) has created a standard designated as C518- Standard Test Method for Steady-State Thermal Transmission Properties by Means of a Heat Flow Meter Apparatus. HeatShield® Cerfractory® Flue Sealant was tested to C518 by ETL-Intertek Testing and found to have a thermal resistance rating 140% greater than that of standard mortars. The HeatShield® Cerfractory® Flue Sealant was found to be compliant with all aspects of this outline of investigation for chimney repair and proven effective for restoring the original integrity of a chimneys ability to contain and convey the products of combustion to the outside. In addition to the HeatShield®/CeCure Sleeve product listing to UL 1777, HeatShield® Cerfractory® Flue Sealant is effective for repair of masonry chimneys that service most gas-fired, oil-fired, and solid-fuel-fired residential-type appliances. The HeatShield® Cerfractory® Flue Sealant and CeCure Sleeve Liner System is available through a network of factory trained, independent installers.